OK let’s get down to it..you have planned and triple checked and booked and paid and now its here…your wedding day! So how do you stay on track; its a difficult task I won’t lie, here are some pit falls to avoid and help you get to the church on time! 1 – Not giving yourself a cushion ~ your bridesmaid can’t find her show, the flower-girl over sleeps, your soon to be mother-in-law keeps getting her hair re-done, the limo got lost…all of these things can totally happen so be ready. Give yourself some extra time between tasks just in case. 2 – Not having enough time between your ceremony & reception for photos ~ if you want to enjoy your cocktail hour with your guests, give yourself at least 2 hour for photos; formals, family shots, ones with your and your honey…nothing is worse then rushed pictures, and you want to make sure you get them all. 3 – Not setting aside time to thank your guests ~ whether its the traditional receiving line after the ceremony or walking around at the reception, your wedding guests appreciate the sentiment and expect it…so will your parents. 4 – Transportation ~ never, ever book just enough time for the limo to get to the hotel to pick up the groom, make a return trip to pick up you, get the the reception…its never enough time. The traffic and weather play a role, what if someone is running late and the limo has to wait…timeline shot! Give a window of at least an hour in your contract, you rather pay it before and have the extra time then after as an “overtime fee”. 5 – Not having enough time to get ready ~ between the hair and make-up, getting the bridesmaids dresses, getting into your undergarments (sometimes a tricky process) and slipping into that gown…don’t forget the photographer wanting to capture it all…it takes time. Always add at least an hour to your getting ready time, you much rather sit in a comfy hotel room all ready to go then to be frantically throwing yourself together because your late. 6 – Keeping your vendors in the loop – be sure that all of your vendors know where they need to be and when. The DJ doesn’t show up when your reception starts, he needs at least 2 hours to set up his equipment. And the photog doesn’t only want you coming down the aisle, he wants shots of your mom slipping your garter on…all of the vendors need to know when and where they should be and at what time. Draft 1 timeline for everyone to keep it simple. Your bridal party should also have a copy so they know where they should be as well. 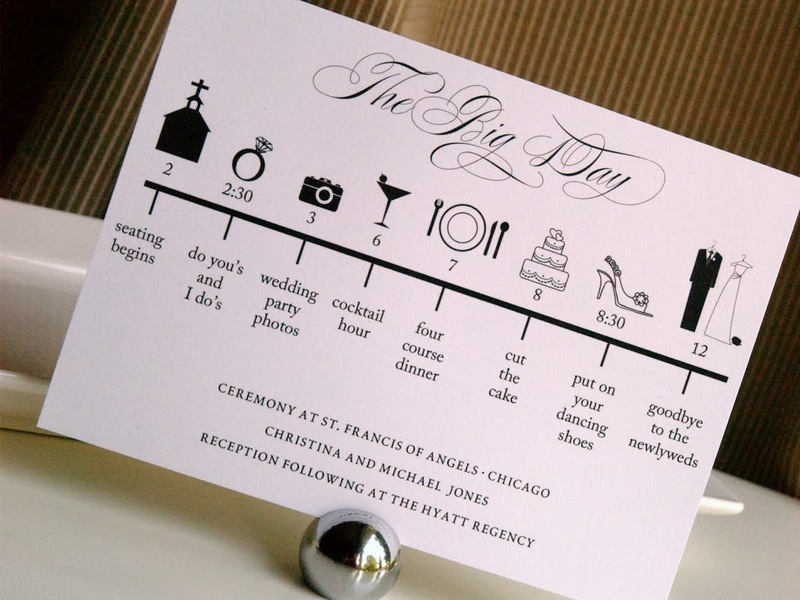 The Groom should have a copy as well to know what time the limo leaves and if he has the timeline he knows…cause they always say the Bride runs late but we know better! And if this seems too overwhelming..hire a planner! They can keep you on time and focused and relaxed…we rock the timelines!